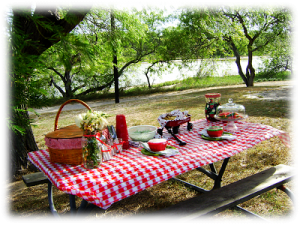 Picnics are a great opportunity for families to enjoy the great outdoors. It provides time to experience special bonding while enjoying the fresh air and delicious food. However, we should always be cautious of food borne illness. Let’s keep food and your family safe from the start! Whether the foods are from home, a store, or restaurant, follow the simple rules of keeping hot foods hot and cold foods cold. Remember that bacteria can grow fast at temperatures between 40°F and 140°F – the Danger Zone. Eat and promptly chill leftovers within two hours, and if the outside air temperature is above 90°F, do so within one hour. If you plan to cook on site, make sure raw meats are packed well and are separated from ready-to-eat foods to prevent any cross-contamination. All perishable foods must be kept cold (40°F or below) in insulated boxes with enough ice, frozen gel packs, or other cold source, such as a container of frozen water. If possible, bring an appliance thermometer along to monitor the box temperature. When you grill the meat, make sure it is cooked to the right temperature. Also, bring enough potable water if none will be available at the site, and pack clean, wet, disposable cloths or moist towelettes and paper towels for cleaning hands and surfaces. Keep your tailgate party fun and bacteria-free for your family’s well-being! Besides the food, plan your time. Plan some fun outdoor games that the entire family will enjoy. You may even plan a nature walk, name the cloud’s shape, or be creative and create your own activity. Whatever you plan, always involve the entire family. Every family member should be included. This is the best time to say “no electronic devices.” This is time for the family to have face time without interruptions – time to talk to each other and grow closer. Picnic time translates “it’s family time” – eating outside in the fresh air and enjoying your family. Family and Consumer Sciences Extension Agent in Jefferson County. I am a Florida A & M University graduate. My teaching experience includes Florida, Georgia, Maryland, Texas and South Korea.